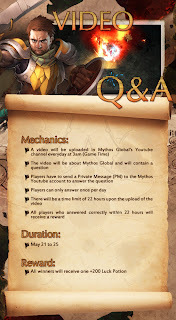 Mythos Global's Two New Events! The Mythos Global team is happy to announce that two new events have just started this week! To participate, simply log-in to your Youtube account and answer the question shown at the end of the video. Send your answer and T3Fun Account ID through Private Message (PM) to the Youtube channel. All players who answered correctly within 22 hours after the video is posted will receive the reward. The second event is called "The Coming." It is a Facebook event so you will need to have a Facebook account to participate in this event. The mechanics are shown below and it is very simple. The image is in the Facebook fan page of Mythos Global. Just click "Like" and "Share" to contribute to the Mythos community. If the goals are met, everyone will receive x2 experience and x2 luck buffs for three days. 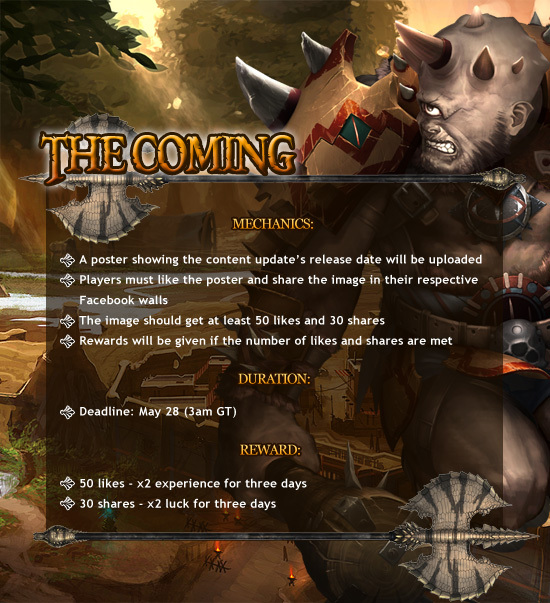 MMORPG.com » Blogs » MythosGlobal » May 2012 » Mythos Global's Two New Events!